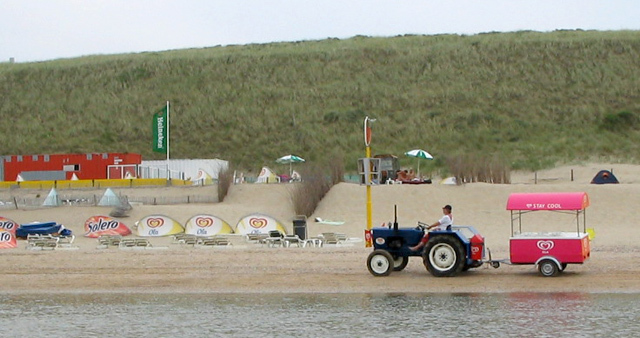 A passing ice cream vendor on Zandvoort beach. 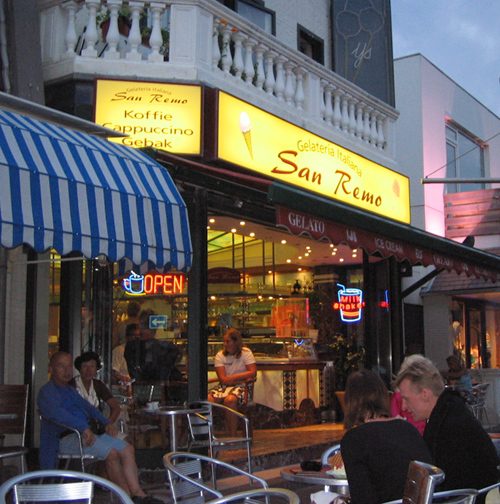 Every good seaside resort offers a choice of places to enjoy ice cream and Zandvoort is certainly no exception. If you’re lucky enough to be on the beach on a beautiful hot sunny day then the attraction of this kind of snack is clear. On the beach itself you can buy it from one of the beach pavilions or from a passing vendor towing their counter/freezer by tractor down the length of the beach. For obvious reasons, these mobile vendors will only be in evidence on the beach in the summer months when they really do a roaring trade..
Down in the village away from the beach there are kiosks offering drinks, snacks and cones and as you might expect, most of the cafes also serve ice cream. However, if you really want to indulge in a speciality, then you can try one of two different ice cream parlours in the village. Firstly there is a small ice cream parlour called Giraudi in Kerkstraat which offers its patrons a choice of tub or cone. There is also a larger parlour, San Remo further into the town in the Haltestraat. 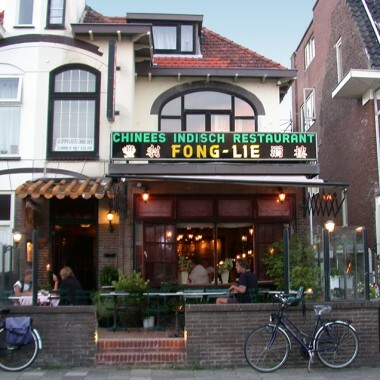 This has been in Zandvoort village for many many years and here you can sit inside or outside and choose from many different flavours, opting for one of their special ice cream sundaes if you really want a treat! This author has eaten at the San Remo on many occasions and can testify to the tastiness of the treats on offer.